In Lisbon, while attending the ICOM-CC conference, I passed a certain building every day going back and forth between the congress center and my hotel. Rather, I should call it the remnant of what looked like to be a 19th c. building, as all that remained was the façade, temporarily buttressed with a sturdy metal construction (fig.1). I couldn’t help thinking of the well-known adage of beauty being only skin-deep. All that was deemed of value were the aesthetic aspects, mostly centering on the cornices. The rest of the building was totally destroyed. And there it waited, that façade, for funding that would bestow upon it a new purpose, replacing original structural and aesthetic functions with a purely superficial cosmetic role. Fig. 1. A forlorn façade on Avenida da Republica in Lisbon. I mulled over the sad (?) fate of that building and tried to imagine what it would look like with a modern appendage attached to its face. A glimpse of what might happen appeared about a kilometer or so further down the street, when I encountered another building, where an older façade was incorporated into a modern architectural design (fig. 2). I thought it was interesting: one little decrepit structure did not stop the bustling growth of a modern city. It was clear that the original building was occupying space with prime real estate value, evidenced by the towering modern edifice. The integration of the older façade was undoubtedly the architect’s way of acknowledging history. I guess one can say that late is better than never – it is sobering to think that that older building was once one in a whole neighborhood of older buildings – one of the lucky façades that survived. Fig. 2. 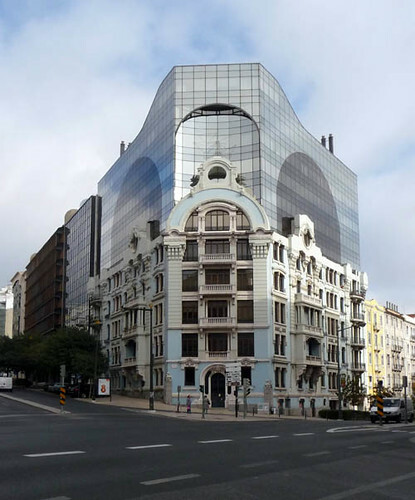 A fusion of old and new architecture on Rua Braamcamp in Lisbon. In ICOM-CC we don’t normally deal with conservation of architecture. But we must acknowledge that some classical conservation theory, such as the writings of Georg Dehio, were formulated with architecture in mind, and, some conservation theories developed with fine art in mind (Cesare Brandi) were avidly applied to architecture. But rather than expounding on the aspects linking the restoration of objects of art and architecture (a worthy subject for another posting, anyone? ), I am using the examples of the two buildings as illustrations in a more narrow discussion – the bold mixing of styles in restoration. My first thought when viewing the modern building that loomed over the older façade was: Only an architect could get away with something like that. What would the conservation world say if Picasso executed the pictorial completion of lacunas in a 19th century painting applying his own style? But, of course, that happens all the time. Countless modern artists incorporate older objects in their artworks – Nam June Paik, being a well-known example. And when such things are done, function is usually restored to the discarded object (fig. 3), sometimes in a new and interesting way. Fig. 3. 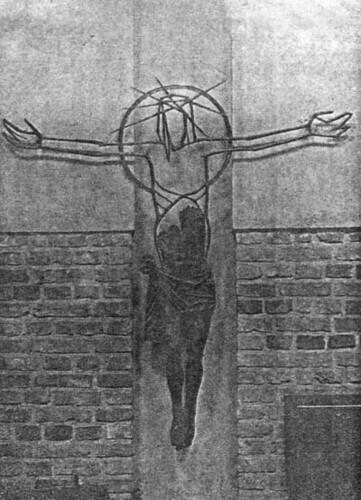 Crucifix from St. Martin’s Church in Warsaw, a fusion of two artistic styles restored this sculpture its function in 1981. Leaving the creation of hybrids (work of artists) behind and concentrating on conservation, I’d like to focus on solutions employing a different aesthetic ‘language’ than that of the object being treated. There are numerous examples where the actions of conservators can be comparable to the examples presented above – when conservators have made equally unequivocal statements: this [reconstruction] is not original. The more ‘foreign’ the addition is, the more honest we are in our intentions. However, as we all know from life in general, perfect honesty has its price. 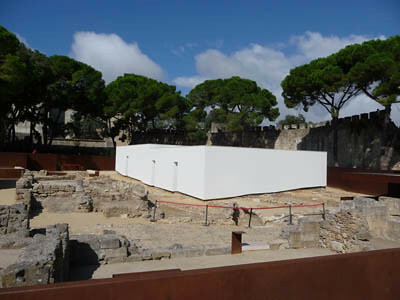 Take, for example another site in Lisbon – the exposition of the archeological ruins at the Castelo de São Jorge. 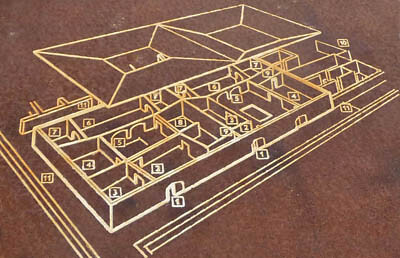 The site displays the foundations of several settlements including one from the Iron Age (7 – 3 c. BC), an Islamic quarter from 11-12th c. and a palace from 15-18th c. The Islamic Quarter was crowned with a white box, a constructed metaphor obviously referring to the original building that had once existed there (fig 4). This was undoubtedly done primarily for pedagogic reasons, but had a very strong aesthetic impact. The painted wooden construction was mounted with utmost respect – it distanced itself from the ruins both aesthetically and physically. The entire structure rested on 3-4 points, hovering over most of the stones by about 5-20 cm, creating an uncanny effect of levitation (fig. 5 and 6). But was this necessary? A plaque with an explanation of the site is available to the viewer (fig. 7). One could question if the box was redundant (it blocked the view of the rooms). Did it really create a more ‘authentic’ experience? I found the stark white construction distracting. It was intentionally far removed from what the original might have looked like, but because of its strong presence, I found it did not stimulate my imagination, but rather stunted it. Fig. 4. The archeological site on Castelo de São Jorge in Lisbon. Fig. 5. 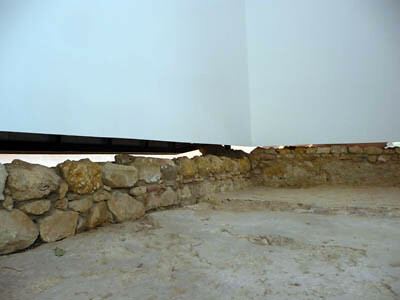 The structure hovers over the foundation, balancing on a few larger stones. Fig. 6. 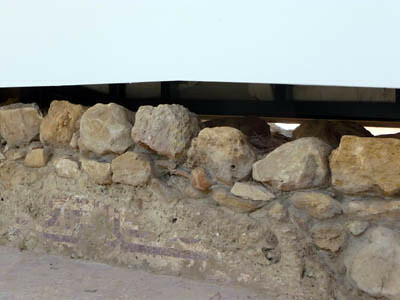 Note the remains of wall paintings on the lower part of the wall. Fig. 7. A plaque explaining the functions of the various rooms that were no longer visible because a large white box blocked the view. That is often the biggest challenge when implementing unequivocal and bold solutions in aesthetic presentations – we want to balance truth and beauty; we want the additions to function as the formative framework, giving meaning to fragments, ruins or severely damaged images (fig. 8). Suddenly, the historical value of some planks rescued from the floor of the sea can be appreciated, and the exposition has enormous pedagogic value. Fig. 8. 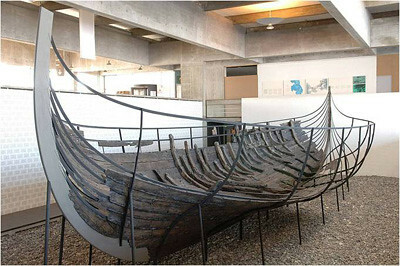 The exposition of a Viking ship in the museum in Roskilde (Denmark). The drive to ‘tell the story’ is one of the main reasons why many objects are subjected to aesthetic completions in one form or other. One can discuss whether these solutions allow the viewer to superimpose his or her imaginary picture of the object as it originally existed, or do these ‘guidelines’ tell the viewer what to see (fig. 9). 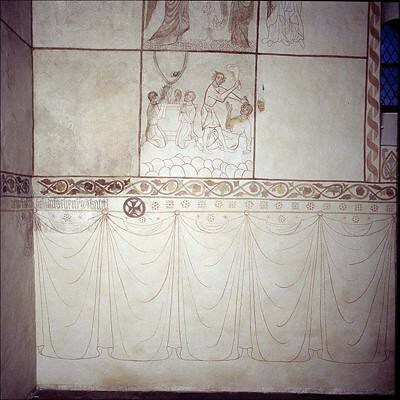 The completion of the lower parts of the wall painting in Tirsted (Denmark) was a replication of the pictorial contents from an earlier restoration, and was done in response to a demand from the church community. The monochromatic line unequivocally states that the pictorial content of the lower part of the wall is not genuine. But perhaps the similarity of technique and palette between the addition and the original painting closes the gap between illusion and honesty. In contrast, nobody could mistake the message in the reconstruction of the pictorial image on the detached fresco displayed in the Bischöfliches Dom- und Diözesanmuseum Trier (Germany) (fig. 10), but does this stimulate our imagination, or act as an obstacle? Fig. 9. The north wall in the chancel in Tirsted, with reconstructions from 2000. Fig. 10. 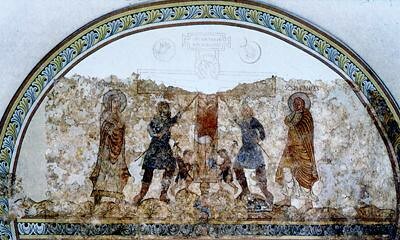 A transferred fresco displayed in the Bischöfliches Dom- und Diözesanmuseum Trier, with a reconstruction from 1988. When do we need to guide the viewer and when can we leave him or her to their own devices? This is not a new dilemma in conservation. Back in 1893, The Danish wall paintings conservator, Jacob Kornerup, felt that leaving a severely damaged Romanesque painting on the apse in Tyvelse Church was an unacceptable solution. 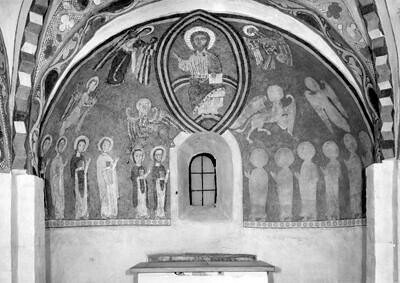 He recreated the missing figures on the right side as ghosts, marking their outer forms, but not filling them in (fig. 11). This was a daring and unusual solution for that time, which was dominated by artist restorers’ free interpretations and reconstructions based on conjecture. This historically important example has survived - happily, it did not disappear in the wave of de-restorations of the 1980s and 90s – the nemesis of so many other historical restorations. Removing historical additions does not necessarily present us with a blank page which we can fill with our imagination (fig 12). It can be just as crippling as many of the examples presented here. I am aware that this is not a very helpful way to end this essay. Whether we choose to refrain from restoring or restore for the sake of comprehension, we might end up following the path of Dr. Frankenstein, and create a monster (I credit my good friend Salvador Muñoz Viñas for introducing the concept of Frankenstein in conservation at the AIC meeting in 2010). What may be truthful may turn out to be ugly. The non-truth also so. Fig. 11. Jacob Kornerp’s aesthetic completion from 1893 still exists today, but a large altarpiece partially blocks it, hence the photo from 1950. Fig. 12. 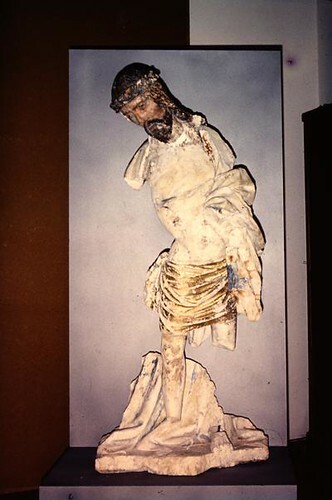 Statue of Christ, after de-restoration in 1985, Krakow Historical Museum. 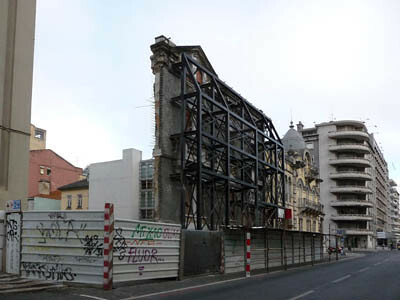 What an interesting summary of the meeting in Lisbon, and your impressions about architectural conservation you found there. The summary goes onto many other topics, but I will particularly focus on your discussion of architecture because that has been on my mind recently. I have noticed that it seems to conserve one object we are purposefully not conserving another, like what you saw in the facade conservation. To remove dirt from one thing, we make another thing dirty; to clean a painting, we remove the varnish; to protect the bricks in a building, we will remove and replace the mortar; and so on. This goes back to a few other points Munoz-Vinas made at the AIC 2011 meeting about minimal intervention, do we ever perform minimal intervention? I wonder if we do. Or do we perform a series of actions that have been performed by others many times before, which have been vetted because of this use and history? I have been thinking recently about treatments, at what point must a conservator intervene? At what point is a treatment 'completed'? Sorry not to provide answers, but perhaps the questions will be enlightening.